Map of water wells within and near proposed Centennial uranium project as of June 17, 2010 - prepared by Petrotek Engineering Corporation, Littleton, Colorado for Powertech (USA) Inc. (PDF 504 KB, 1 page) This map shows the dozens of water wells located within the permit area of Powertech's proposed Centennial project and the hundreds of wells that surround it. The in-situ leach mining process would involve the injection, extraction, and recirculation through the Laramie-Fox Hills aquifer of millions of gallons of water contaminated with uranium, radium, heavy metals, and various chemicals for a period of 14 years or more. Powertech claims it can prevent contamination of household, domestic, and agricultural wells by using a combination of monitoring wells, pumping adjustments, and water treatment. The map was submitted to the EPA's Region 8 office as part of an application for an underground injection permit for multiple deep disposal wells. Powertech submitted the map as part of a 13-page, 25 MB PDF file that was password-protected, preventing extraction and distribution of the individual maps and figures. Topo and Drill Hole Location Map - Indian Springs and Centennial Uranium Projects, Weld County, Colorado - Powertech (USA) Inc. (with annotations) - March 2007 (PDF 137 KB) This map shows the 3,500 abandoned exploration boreholes drilled by Rocky Mountain Energy over 20 years ago. 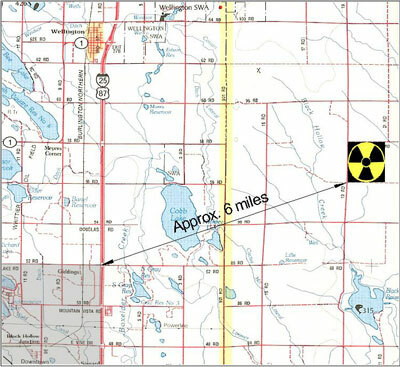 If in-situ leach uranium mining were to occur, boreholes that are not properly plugged could allow radioactive and toxic mining fluids to escape the mining zone and migrate into other aquifers. Domestic Well Permit Location Map - Centennial Uranium Project, Weld County, Colorado - CONFIDENTIAL, NOT FOR REPRODUCTION OR DISTRIBUTION - Powertech (USA) Inc. - March 26, 2008 (PDF 4,033 KB) This map shows the location of uranium ore bodies and nearby domestic and agricultural wells.